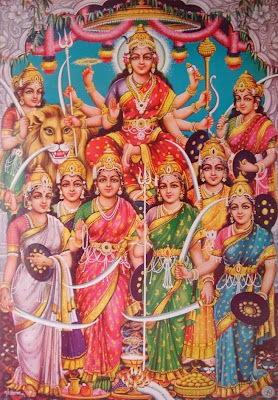 The Nine Goddess to Worship on Navratri Festival The Hindu festival of Navaratri lasts for 9 days which are dedicated to nine forms of Mother Goddess. Each day of Navratri is dedicated to one form of Goddess Durga. Below are the details of the 9 Goddess of Navaratri Festival. Goddess Durga’s first form is called Shailputri who is considered as the daughter of the Himalayas. The first night of Navratras is devoted to the puja of Durga Shailputri. The goddess is represented mounted on Nandi holding a trident and lotus flower in her hands. Goddess Durga is worshiped as Goddess Brahmacharini on the second day of Navratri. Here “Brahma” literally means ‘Tapa’ or penance. Goddess Parvati before marriage was Devi Tapsvini and Devi Yogni. The goddess is worshiped as Chandraghanta on the third day of Navratras. She symbolizes beauty and bravery. On this day, Goddess Durga is worshiped as Kushmanda. Traditions say that Goddess Kushmanda created the entire Universe by her laugh. Skand Mata is the name given to the Goddess on the fifth day. She is represented as the mother of Skanda (Lord Murugan), the chief warrior of the Gods army. The Goddess is worshiped as Katyayani on this day. Katyayani has three eyes and four hands and is seated on her vehicle, lion. Kalratri is worshipped on the seventh day. She is in black and has four hands. Kalratri bestows courage to her devotees. The Goddess is worshiped as Maha Gauri. Dressed in white attire and white colored ornaments, the Goddess represents calmness and wisdom. Siddhidatri is worshiped on the ninth day. She is believed to have all the eight siddhis and is seated on lotus. Siddhidatri is worshipped by all the Rishis - Munis, Siddhas, Sadhakas and Yogis.